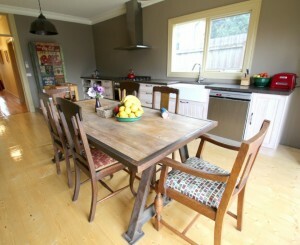 Industrial styling customised for a Ballarat kitchen. 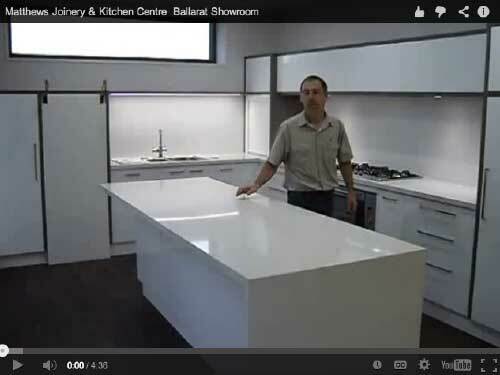 We recently installed a custom kitchen in Ballarat that needed to fulfill quite a specific brief. 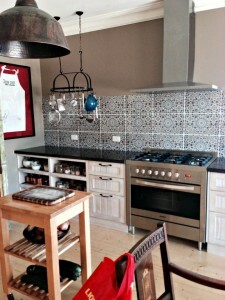 Our client’s wanted to achieve an industrial look for their new kitchen. Upon visiting our showroom our client saw the display of a custom door that is exclusive to Matthews Joinery. This door is hand crafted locally from solid timber and then the custom lime wash finish is applied by our polisher. It is a lovely aged look that works equally well for a country/farmhouse application. Open pull out shelves are great for access and aesthetics. 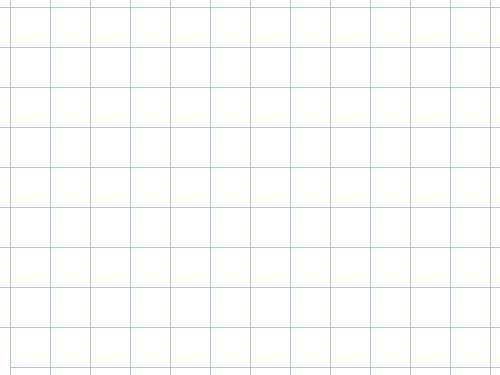 Why WASTE space? We put the bin under the Butlers sink. 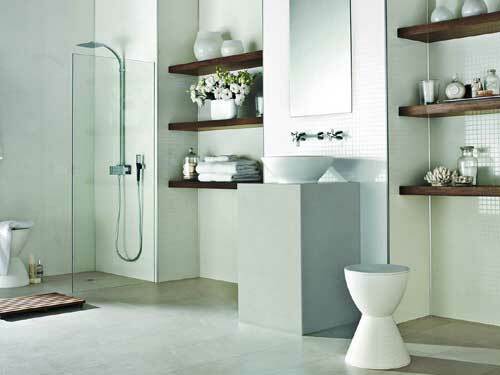 What can you do with a hard to reach cabinet under a butler’s sink? 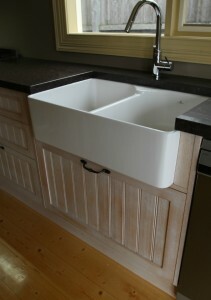 A double butlers sink was supplied by Matthews Joinery and teamed with an industrial style tap. The bench tops are made from Caesar Stone, Cocoa Fudge. 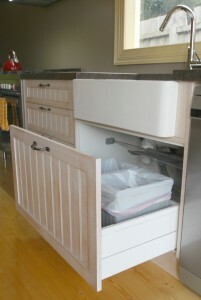 To make the cabinet below the sink useful we used a bin system specially designed to be fitted into a drawer. Bin placement is an essential element to a good kitchen layout. There is nothing worse than seeing a new kitchen with a bin sat on the floor at the end of a bench. The unusual teaming of a traditional sink and the Industrial look makes this kitchen stand apart from the mundane. 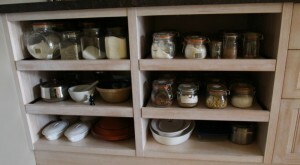 All drawers have Blum Tandembox 30kg and 50kg full extension softclose runners. Open shelving in kitchens give a homey feel. The client requested open shelving. To improve the access to these we made them pull out on full extension runners. All doors are fitted with softclose hinges , a nice touch so nothing bangs! Our client was thrilled with the end result. The room has a lovely warm feel and is quite different from any other kitchen. The team at Matthews Joinery pride ourselves on working with our client’s to achieve their dream and it is very rewarding for us all when the results are this good. Why not make a time to meet with me and discuss your ideas for your project. UPDATE ! What a difference a splashback can make ! Industrial Kitchen with WOW factor splashback! 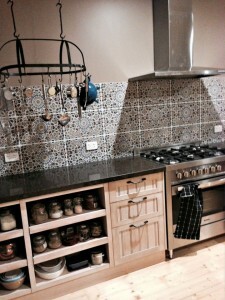 Our Client recently sent me these updated photos with this beautiful tiled splashback! 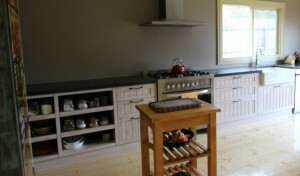 It really finishes off the look of the Industrial kitchen custom built by Matthews Joinery.